Businetiks is a coaching system to help entrepreneurs and executives get more out of their work and their lives. 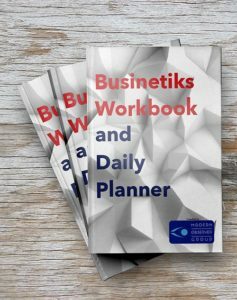 The Businetiks Planner is a daily planner to help you organize your life, track the way you work, and improve your productivity and mental well-being. COMING SOON: The Businetiks Way takes you through the seven elements of the Businetiks system. Looking at Mindset, Focus, Operations, Communications, Innovation, Evaluation and Improvement, The Businetiks Way teaches you to use the elements of this system to improve your business and your career.